O degrees. True North. Everything starts from here. This has been quite a week. Although on the exterior our life doesn’t appear to have changed much, beneath the visible surface of our everyday comings and goings the tiny eddies of life are swirling about us, tugging us along to join up with new currents on unknown trajectories. Serendipitous events fall into our path, questions and open-ended quandaries seem to solve themselves, and in spite of the tiny disappointments that tempt us to mope and wonder ‘why me?’, there seems to be a general lightening of our load; a new pathway through the woods is gradually emerging; our direction is becoming clearer. Only this morning did it really dawn on me that I am, in a way I have not been since the birth of my child, free. Elihu and I have had several candid and long conversations about this changing time in his life, and it’s fast becoming clear to me that he is fairly capable of taking care of himself. Yesterday, however, we experienced a small bump in the road when he came home near tears after having done poorly on two tests. He prides himself on always doing well, on always understanding the material. But, like me, he is a bit of a spazz and sometimes easily distracted. He misses assignments, he loses papers, he bites of more than he can chew and then freaks out over his heavy load and then must rush to catch up. And yesterday, he was not only heartbroken over his poor performance at school, but he was simply exhausted. He didn’t need to tell me either; he had dark purple crescents under his eyes, and his pupils shook visibly (with Achromatopsia comes the partner disorder Nystagmus – or the slight quivering of pupils – something which becomes more pronounced when a person is tired. Poor kid, he’ll never be able to lie about that. I can always tell when his body’s had enough.) His performance was so uncharacteristic that his teacher had even called me shortly before Elihu arrived home from school. I had been ready. It was time to check in. When Elihu is this tired, his eyes cannot tolerate light. I know this well, of course, and every window in our tiny home is covered with a film of tinted plastic, including the huge picture window in our living room. But even that is not enough to filter out the light to a tolerable level when the kid’s as wiped as this. I pulled the curtains shut, then invited him to join me on the big couch. He sat next to me, and I scooped in the pillows and draped our bodies with a comforter. He snuggled into me, tears still pouring as he relived the math test and how he’d balked at material he’d thought he understood. He was deeply disappointed to have ‘ruined his record’, of having done poorly on both math and language arts (for a kids who’s doing Ghost from Hamlet and who simply milks the language for all it’s worth, this was a surprise). He’d completely missed an assignment to study vocabulary words – how did he miss it? he wanted to know. I put my arms around him as he calmed down, and I waited for the moment to turn things around. I assured him I knew exactly how he felt. And I did. I also reminded him that when things are mysterious and seem too much to comprehend – break things down. This was something I’d had to remind myself of over and over this past week as I drafted the final bylaws for the Studio. Break it down. We reviewed his days, his class schedules and the means by which he learned his assignments. We found a few holes in his systems (or lack thereof) and discussed a few ways we could both be proactive in improving them. Good. Progress. As we chatted – for more than a half hour – we also talked about the near future, and the way in which he would soon be changing. He’d had deep aches and pains this week, and my guess was that it was due to his growing. We both had seen the massive volume of food he’d eaten – when just a few weeks ago he had been eating like a bird. And certainly the girls in his class were changing. This seemed to be the window in which life as we’d known it thus far would turn into something quite different. “Please don’t take this the wrong way,” he said from his cozy nook inside the nest of pillows, “but I do want to move out as soon as it’s possible.” I knew what he meant. “I want to be on my own. I like being on my own.” I told him I understood. His grandma would understand, too. So would his uncle. All of us enjoyed our solitude. He went on with his thoughts, “I don’t always like all the extra help you give me. And you know the way you label everything so I can find it, and you’re always saying (he raised his voice in a silly mock-adult tone) ‘Oh, I’ve put everything where you can see it, and I’ve installed safety handrails in the refrigerator’?” We both laughed. “Is it that bad?” I asked. “I’m just trying to empower you to get stuff for yourself. You know that, right?” He agreed that he did, but assured me, colorblind or not, legally blind or not, he would one day have to figure out all this stuff for himself. I assured him that I just wanted to give him an easier entree into the real world. And I promised him not to worry – that before long, his life would be all his. A few days ago I went to Albany, the state capital of New York, to pick up copies of my father’s incorporation papers from 1959. When I examined them to see that they were all in order, I was taken aback. There before me were the original articles of incorporation, mission statement and all. Every page, of course, hand-typed. There was my father’s creation, there was his dream, first made legally manifest. There was the address from grand Passaic Avenue, the house where he had grown up. My goodness, he was young back then. This even pre-dated his first apartment on West 57th. It was hard for me to imagine this time in his life, and what his vision for the future might have looked like back then. There, beneath his name were the names of his dear friend and attorney, and also my Godfather. I was lost in nostalgia and sentimental thoughts when I snapped to, realizing that this was a busy place, and while all these thoughts and feelings were filling my head, there were folks in line behind me who had their own stories that needed an audience with the Department of State. I tucked the documents into a folder, and as I turned to leave, I smiled at the Indian gentleman who’d announced me earlier, when I’d arrived, as ‘a young lady needing some assistance.’ ! Having this document finally in my hands somehow seemed a piece that had, until now, been missing. It felt like a confirmation, telling me unquestionably what my job was now. What my father had started, I would continue. Seeing the text before me, the mission, the declaration that ‘no person shall enure benefit from said corporation’ … I knew there was no turning back now – and my spirits were greatly lifted to see this all in black and white, to hold these papers in my very hands… I left the office building (how exciting to be in an actual city once again, and to ride a, gasp, elevator!!) and hit the rainy streets to head back to my car, deeply invigorated to see this thing through to a successful conclusion. Heading back to the highway (it’s surprisingly simple to go from my modest, rural home to the bustling state capitol!) I stopped at a strip of third-world looking storefronts which boasted things like international calling cards, halal meat and wigs. Perfect. I needed a few Indian staples which certainly could not be found in my ultra-white part of the world. I entered a shop where I saw a short woman completely covered in a black hijab, and I was taken aback at the sight of her eyes peering out from the tiny, rectangular slit in the fabric. I scolded myself for wanting to stare longer at the foreign-looking figure and made my way between the narrow shelves piled high with sacks of dal and rice, searching out my favorite mango pickle and some candied fennel seeds for Elihu. We zipped, free-associatively from one topic to another, with me unintentionally playing the anthropological interviewer… I cannot help myself; when I get the opportunity to hear a person’s story, I want all that that person is willing to give, and all that my time will allow me to receive. I thoroughly enjoyed our visit, and I’m sure Hope did too. When I finally gathered my things to leave, I mentioned something about food – I had wondered where I might get some naan before left the neighborhood – and instantly she plunked a package down on the counter. “Here, take this.” It was a lump of tin foil inside a plastic bag. I knew exactly what it was. The package screamed Devon Street from ‘back home’ in Chicago. It said ‘Pakistani food’ down to the generic smiley face on the bag. “It’s chicken kabob with naan. It’s from my ex’s restaurant.” I protested, and I asked if I took it, what would she eat? “Oh, honey, I can get more. Believe me, I can get more.” After the backstory she had just shared, I knew for sure that she could. Giving food is a deeply personal gesture, and so too, I suppose, is receiving it. It struck me later, as I opened the fragrant package and served it for supper, that it is a supreme act of trust that one eats food from, well, a stranger. But it is also a living metaphor for the way in which we must simply trust each other in this life. How we must support each other, show kindness and give of ourselves when the opportunity arises. How we must learn to receive as well as give. Thus we are all interdependent upon each other, no matter how solitary our private lives may be. And in the giving and receiving of such gifts, one is made to understand that ultimately, the directions that our lives take are each so influenced and guided by those few and special friendships and associations which pop up along the way. Elihu and I had the most flavorful dinner we’d had in a long while, made tastier still because it was altogether a surprise for both of us. We thanked Hope for our meal before we ate, and then we chatted into the night, pausing here and there to tear off small pieces of the naan, chewing thoughtfully, slowly, until there was finally nothing left on the plate but crumbs. For several years now, I have wished to own an altimeter. I find the topography in this part of the world mysterious and fascinating, and have always wanted to know precisely how much the ground is dropping or rising as I make my way over the countryside. The elevation of our house is a mere 300 feet higher than the city of Saratoga Springs, just five miles away, and yet the perspective is radically different; we can see far over the top of town to the Hudson Valley beyond, and the Green Mountains of Vermont are visible in the distance. I’m even amazed how the view improves simply by standing atop the porch roof – just eight feet of elevation makes a huge difference. And I can’t help but see the metaphor here too; a small change can make a big difference in how things look. Not that I can ever truly justify buying things I don’t need (when heating oil, food and electricity are still so hard-won each month) but there was a short time a few weeks ago when I actually had a little room to buy something. The altimeter was still very much on my mind, so I bought it. 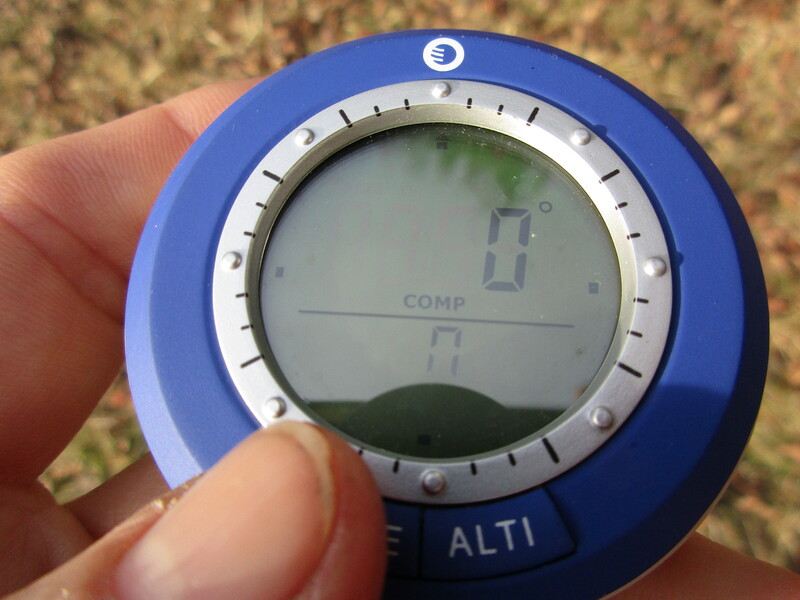 Finally, after years of comparing and thinking and mulling and asking and reading reviews, I found myself this little gem of a tool – clock, barometer, thermometer, compass and altimeter, all in one. !! I didn’t hesitate to order it, and since the thing arrived I have not let it out of my sight. I check it second by second as I descend down the winding road into town, I check it as I walk the driveway or down the hill… The compass has become a new find, too. Having paid more close attention recently to the position of the rising sun on the horizon, it’s been very satisfying to learn at exactly what points on the compass things are happening. I always kinda knew North was a bit out the front door and to the left – ah, but now I know precisely how far to the left. And it gives me a great deal of satisfaction to know exactly where I stand. Having the compass in hand reminded me of a time a good decade past, when I was at the helm of a boat, all by myself, in the middle of the Atlantic. It was nighttime, and I was taking my turn on watch, at the wheel. The weather was getting rough quickly, and the auto nav feature, which had been working only intermittently until then, finally gave out. The large wheel began spinning quickly (as it was no longer physically linked to the navigation system) and I had to grab it, stop it from spinning, and then restore our original course. Here was my dilemma: there was now no screen to tell me where we were, and it was raining – there were no stars to use, either. I righted the course as best I could, but intuition is of little use in the dark and in the middle of an ocean. One needs firm bearings. How could I do this? How could I make sure we didn’t end up 300 miles off course by the time the rest of the crew woke up? There was nothing at hand with which to tie the wheel in place so I could go and get help, and no one down below (all of them sleeping through the storm) would have heard me, even if I had screamed. What to do?? Man, how did they do this in the old days? For a moment I sat with this, in the dark, puzzled, but strangely, not afraid. And I remember the moment when the answer came to me – because I laughed like a crazy person (while buckets of water landed on my head as if thrown in from off-camera in a movie scene). I needed to use the compass! I mean, duh!! The enormous glass dome that sat inside the wheel was an old-fashioned, magnetically-driven compass! I remembered our fix and turned the boat back to its correct course. I sat there for three more hours, holding onto the wheel and muscling it to keep firm as the ocean tried endlessly to tug it away from me. When my watch was over and my relief came, I released the wheel and my arms instantly became like rubber. Only after the whole affair did the gravity of it really sink in; I’d seen the toe rail dip several feet under the water as we listed at a frighteningly steep angle, the sails were under way too much power, and I was the least equipped of the crew to have been in charge under such circumstances. I suppose on the whole, looking back at it now, I was lucky. I had lost all my modern support system, and the stars, too. But that compass kept me on course. That trusty gadget told me exactly where it was that I needed to go. Seriously. Thank God for that blessed invention. Unless I take off into the deep woods around here, I’m not sure my compass and altimeter will ever become much more than a novelty. But no matter, I’m thrilled to have it, because I enjoy the feeling of knowing where I stand, and just where everything else stands in relationship to me. Somehow, having that little gadget at the end of my keychain, always with me, it gives me a sense of comfort. It’s all there, telling me exactly how I relate to the world. And I love it. It feels like I’m getting a clearer sense of where I stand in my life, too. Recently, the Town of Greenfield made an inquiry as to the status of the Studio, and when I called to follow up and check in, I got the feeling that my relationship with the town might be on shaky ground. I did my best to assure the town assessor that things were moving along, our future looked good – but that wasn’t what concerned her. She wanted to know just what exactly was going on there. She noted we’d had some recent renovations but had not communicated this to the town. Me, I don’t know the procedures, so if I should have let them know – or filed a permit, I surely didn’t. I realize being unaware of a rule doesn’t always get you off the hook for not abiding by them, but here I hoped she’d go easy on me once I’d presented all my paperwork. After all, the only thing I ever set out to do was repair the damage from the flood that happened just after dad died. I just wanted to fix it so we could use the place once again. I did, and here we are. My attorney gave me a checklist last year to help keep me on track, (something which I’ve been dutifully avoiding until now), and the woman who’s helping me with my books has been another Godsend, as she too provides me with not only to-do lists, but a good deal of positive, maternal energy, reminding me to breathe, telling me it’s all ok, that I can in fact do this (my choice of words might be more like ‘pull this off’, as if it were a heist or something). Like my dear son, and like so many other human beings are wont to do, I have put off dealing with this whole affair until it was absolutely unavoidable. But the looming deadline given to me by the town has forced my hand, and over the past week I’ve rustled up some of the most dynamic people I know to help pilot this ship. I’d held secret hopes that these certain women might share the dream with me, but til my back was against the wall I hadn’t had the conviction to ask them. But I did, every last one – and I couldn’t be more thrilled that they all accepted. So things look promising right now. At least on paper. Or so I think. I’m not much of a numbers or papers kinda gal, but I think I did a fair job of dotting my Is and crossing my Ts… At the very least, I aim to be as transparent as humanly possible. My only intention is to be given the platform and support with which to create and grow a small center of arts and human interaction. And while I may not know exactly how it is that I’ll get there, at the very least I have a better understanding of where it is that I stand in the world, and my direction is becoming clearer every day.